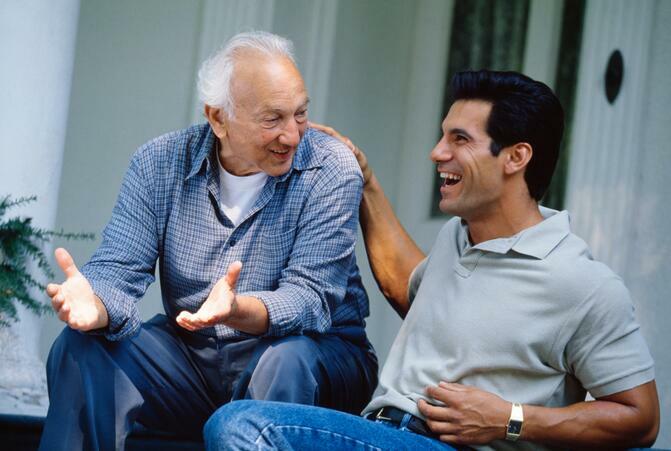 Looking for a strategy for having the conversation about senior living with your parents? Listen to this expert podcast for advice. There comes a time for many adults when they feel they need to talk to their parents about the future. Maybe dad has a health condition and needs help with daily activities. Perhaps mom could use more nutritious meals and doesn’t want to worry about home maintenance anymore. Maybe both of them would benefit from interaction with people their own age. Lisa Holland, regional director of quality improvement, says planning ahead for future needs is important for all people, at all stages of life. But that conversation can be emotional and difficult for aging parents, so it’s important to treat them with respect and sensitivity. Holland: This kind of a talk shifts the roles of the parent and adult child, so that the adult child really becomes more of the parent in the sense that they’re guiding, offering advice, making suggestions about what’s the best way to do things. And that can create a tricky situation because your parents are adults, but you’re feeling more responsible and feeling like you need to help them get a handle on what kind of decisions they’re going to make in the future—without insulting their own ability to plan ahead and being disrespectful to them in a way. HumanGood: So what can you do to prepare for this conversation? Holland offers these strategies. Holland: I think it’s really important to know your parents and know their style, and really kind of set realistic expectations for how things are going to go. Are your parents planners? Have they always been planners? Then they’re going to want to be in control of their decision. They’re going to want to start early, and they’re going to want to know what their options are so they can review them. Are your parents procrastinators? If they’re procrastinators, they probably know the benefits of planning ahead, but they’re always in the state of feeling like they’re not ready, or they’re too busy or the need to plan is not imminent­—so you have to approach that a little bit differently. You would want to offer different types of support, and you may need to spend a little bit more time discussing the risks of not planning ahead and taking small steps so that it doesn’t feel so overwhelming. So you may discuss advance directives, or you may just pick up a couple of brochures or surf the web a little bit about the senior living community or services that will help them in the home, whether it’s extra gardening, or a handyman or housekeeping—something maybe that they’re not using now that would make their life a little bit better, and start in small increments. HumanGood: If you have siblings, find out who wants to be involved in the discussion with your parents, and make sure they’re available for the chat. Holland: I think it’s ideal if everyone can all sit down together. If not, a phone call may be the next best way to go. I think that as long as everyone is OK with the way that it’s happening, that’s the most important part. If someone’s going to feel left out or be resentful, then you have to try to nip that in the bud and accommodate things so that everyone can be on the same page and feel like they have an equal footing if they want one in the process. I’ve seen lots of families where siblings naturally work it out. There’s someone who’s maybe naturally a little bit more organized so that person takes on the role of researching things or helping with the day-to-day things. And then there may be a sibling closer in proximity. So that person can help with errands or driving the parents to and from places if that’s necessary and appropriate. HumanGood: When it comes time to have the actual conversation with your parents, there are certain strategies you can employ to get your point across while still being sensitive to your parents’ wishes. Holland: Adult children could start things off on the wrong path if they go in with their own idea, with their own agenda of what they think mom and dad need to do. We should be listening twice as much as we’re talking, and I think that’s so important. You’re listening not just to the words that they’re saying, but you’re listening with all of your expression. If you have parents who are a little bit resistant, wanting to procrastinate, it is such a good idea to make the conversation about you. And if you haven’t taken care of these things for your own self, that’s a great thing to do. So, “I just put together my durable power of attorney and I’ve been looking into estate planning for myself. This is what I’ve learned. Have you done any of that?” Have those kinds of discussions and conversations with your parents so that they know that you’re modeling by example. HumanGood: For parents who don’t feel they are ready to think about long-term planning and a new living situation, Holland says to try this kind of language. Holland: If you are feeling like you’re happy at home and we’re able to get the things that we need for you to stay at home, I’ll support you 100 percent in trying to make that happen. I do want you to know that there are other living arrangements available, and I know that a lot of people are reluctant to consider retirement living. But in reality, it’s a really nice opportunity to be with people that you can share a community with and support each other and share fun times. So it’s something to think about. I know how much you like doing activities with your friends, so an environment like that, you might find rewarding and satisfying. HumanGood: If, after this conversation, your parent will not entertain the idea of moving or getting a little more help around the house, Holland says to be patient. And sadly that’s reality sometimes. The best thing you can do for yourself as an adult child is assess what reality is and then make your choices about what you can or what you’re willing to do and move forward from there.